As the National Socialism became more powerful with Adolf Hitler in Germany and Europe, Art became affected around this content. Hitler was a painter when he was a youngster, but he couldn’t get to the Venetia art academy. Then he joined military and took military orders, but his soul didn’t part from art. With Hitler’s order in 1933, Nazi government started to collect lots of modern works that were not accepted by them and labeled them “Degenerate Art”. They also began to control the artists’ activities. Nazi Government evacuated German museums from modern works, such as artistic movements of expressionism, surrealism, dadaism, cubism, Fauvism, and new objectivity and eventually collected more than 20 thousand works. They banned presenting such works in museums and galleries. Then, they presented 700 works (painting, sculpture, print) in an exhibition named “Degenerate Art” in Munich in July 19th, and invited people to visit and ridicule these works. After few days of its opening, they held another exhibition named “Great German Art Exhibition” and presented their accepted works, such as Adolf Wiesel, and Arno Breker’s works. Hitler was interested in Romantic Style of painting of 19th century, so lots of works in this style were also presented in this exhibition. Traditional and historical paintings, landscape and naked paintings were presented in this exhibition; and while the subjects became closer to the reality, it was being Hitler’s cup of tea. Degenerate art exhibition was held in other cities in Germany and Austria, and it generally had more than 2 million visitors which was more than treble against the great German art exhibition’s visitors. It is remembered as the most visited modern art works’ exhibition. In 1939, some of these works were auctioned in Switzerland; “The sick kid”, Edward Munch’s work was among them, and now it is in Tate museum in London. 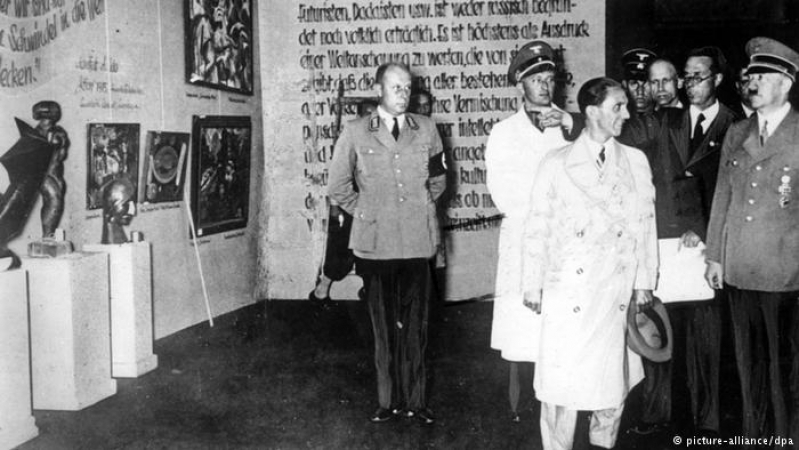 Degenerate art works were also auctioned in years later. Around 5000 works from degenerate art were burned in Berlin in 1939 and in years later secretly; there were lots of Picasso’s works among them. Between 6 and 10 thousand of these works were sold, and the others were destroyed and disappeared. There were hundreds of works that supposed to be destroyed, but later they were found in Cornelius Gorlit’s apartment. Cornelius Gorlit was the son of Hilde BerandGorlit, one of Hitler’s art dealers. When Hilde Berand passed away in 1956, he left more than 1280 unique works for his son to support his old age. Whenever Cornelius Gorlit needed money, he sold one of the painting until the confiscation of works in February 28th 2012. He died at age 81 in 2014. From the time of works’ discovery till now, the public prosecutor of Germany assesses the ownership of these works in a complicated legal file. The outstanding artists whose works were entitled degenerate art by Nazi government are Pablo Picasso, Salvador Felipe Jacinto Dali, Joseph Fernand Henri Léger, Joan Miró, Vincent Willem van Gogh, Edward Munch, Mark Chagall, Max Beckmann, Wilhelm Heinrich Otto Dix, Max Ernst, George Grosz, Erich Heckel, Vasili Kandinsky, Ernst Ludwig Kirchner, Paul Klee, Oskar Kokoschka, Franz Marc, Jean Met zinger, Piet Mondrian, Otto Müller, Emil Nolde, and Max Pechstein.